PCmover Ultimate is the easiest way to restore or move to a new PC without leaving anything behind, even when there are different versions of Windows on the old and new PC. Nothing is changed on the old PC and nothing is overwritten on the new PC. 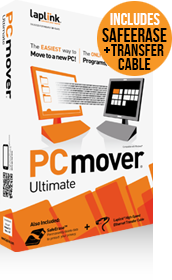 Transfer In PCmover, select a PC to PC migration or a migration from a hard drive. Connect devices with the Ethernet cable, and select a cable transfer. You should remove trial software on the new computer if a full version exists on your old PC. Please note that PCmover Ultimate serial numbers are unique to PCmover Ultimate and will not work with other editions of PCmover. Copyright 1983-2019. Laplink Software, Inc. All Rights Reserved.